Starz has released the first teaser for upcoming thriller Counterpart, which stars Oscar winner JK Simmons as a man working at a spy agency. Starz has released the first teaser for upcoming thriller Counterpart and in it, we see that near silence can say more than any words could muster. From Justin Marks (The Jungle Book), Counterpart tells the story of Howard Silk (JK Simmons), a low level player at a Berlin-based UN spy agency. After discovering that his agency is guarding the secret of crossing into parallel dimensions, Howard finds himself thrust into a world he never knew exist, one in which his life is on the line and one where the only person he can trust is a near-identical copy of himself from a parallel world. In addition to Simmons, Counterpart stars Olivia Williams (The Sixth Sense), Nazanin Boniadi (Homeland), Harry Lloyd (Manhattan), Nicholas Pinnock (Marcella), and Ulrich Thomson (Banshee). 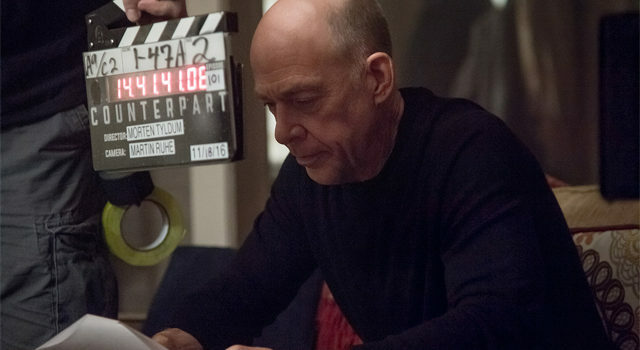 Counterpart is set to premiere next year on Starz, where it will join a scripted slate that includes Power, Outlander, and Ash vs Evil Dead. Shilo Adams is a contributor to KSiteTV who has written for the likes of TVOvermind, ScreenFad, and TVHackr. You can e-mail him at sda2107@gmail.com or follow him on Twitter @sda0918.